Operating Hours: Guided Tour March - October Daily at 11 am. Self Guided Tour November - February Daily 10am to 3pm. Close Time: Closed 25th December & 1st January. There's no better way to see the sights and learn the history of Madrid than with Trixi. 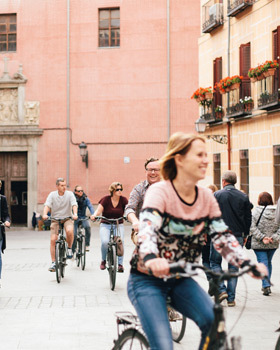 Our three hour bike tour is the perfect way to spend some hours in Madrid. We guarantee you the company of a knowledgeable English-speaking monitor, a comfortable and easy to ride bike, useful tips and advice about what to do and see while in Madrid. You get to know the “must see” places and also spots away from the typical paths in a short time and a relaxed way. Option: A self- guided tour includes a map, description, lock and helmet and a drink.